“Listen, you fool” | reading interrupted. This is how Harper Lee, author of To Kill a Mockingbird, starts her letter to Robert E. Bell, and what a wonderful way to start a letter it is! She admonishes herself for waiting an entire year after his novel’s publication (he wrote The Butterfly Tree in 1959) to write and tell him how much she admires his book. Nelle (her first name and the one she uses to sign the letter) certainly knows how to write a great letter. This is another gem from The Morgan Library’s collection. 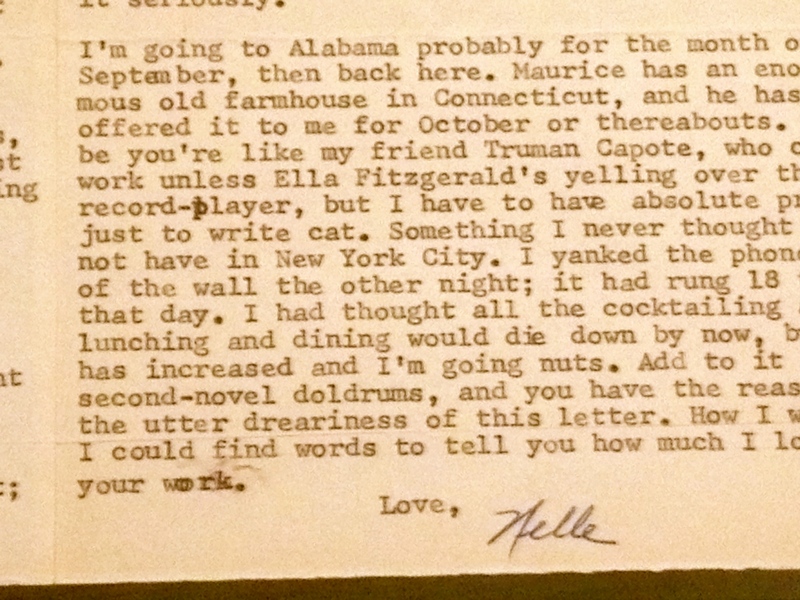 They periodically change what they put on display, and I was delighted to find her letter there this past weekend. I’ve never read The Butterfly Tree so I will, of course, be picking it up – with a recommendation like this, how could I not? This entry was posted in books and reading and tagged authors, books, Harper Lee, letters, library, Museum, reading, Robert E. Bell, The Butterfly Tree, The Morgan Library by Letizia. Bookmark the permalink. Next time I write on your blog, I will start it “Hey, fool: I love your writing” haha! 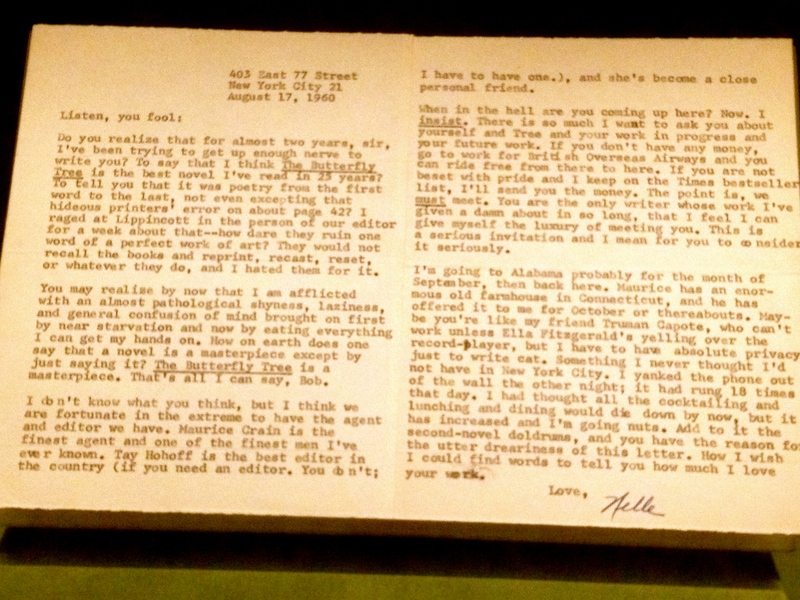 I also love this way of starting a letter….”listen you fool….” It is genius and totally catches your attention…. It is genius, isn’t it? I like the tone of her whole letter! I just ordered Bell’s book and will pass it along to you when I finish it. Great post! Hope you’ll let us know how you like the Butterfly Tree. I will! Have you read it? No, never even heard of it. But I’m intrigued. It’s a good enough recommendation for me. Do you suppose that printers error has been carried through in subsequent editions? What a good question. In a way, I hope it has. Although, it probably shouldn’t. I’ll let you know when my copy arrives. Letizia. You have the most wonderful post! As a child I read her one and only published book and fell for Scout, head over heels. I, along with countless others, wish she would have published more novels. She certainly has a way with words. She really does have her own style! I read that she wrote another book – at least a draft of one- but never felt comfortable publishing it. But one book is fine too- especially such a fine one! Okay. I am totally ashamed now. I have never read To Kill a Mockingbird but will get it out of the library forthwith. I think I will get out The Butterfly Tree at the same time and see what she’s talking about. Arggggggh…too many books, too little, um, well, just call me a fool. 🙂 Love the letter. Don’t know that I have a right to comment here, but I’m excited for you. I re-read Mockingbird earlier this year and fell in love all over again. Wishing you happy reading on this great book. Lucky you to read To Kill a Mockingbird for the first time! I read it for the first time in school which, I imagine, always influences one’s reading, although I did love it. Thanks Letizia…I am looking forward to reading it! She is quite the story, and wrote quite the book. Monumental, maybe? I think so. I’ll let you know if I like The Butterfly Tree as much as she did. I’m so curious to read it now. I won’t go all Mr. T on you, but listen up. Write on. Wow, what an incredible letter to stumble across by chance and a most delightful recommendation, I can’t wait to hear what you think about The Butterfly Tree! I always find pearls like this at The Morgan. This one was in a big display box with other letters so I almost walked by it until the start of it caught my eye. I’m glad it did, Claire! OK, am I the only one who read that as a letter to Robert E. Lee, and thinking calling him a fool isn’t going to end well? That would be funny! If I’m not mistaken, Harper Lee was related to him in some way…. Thanks for dropping by and commenting, Jon. I had to go and look that up, and apparently it’s a rural myth 😦 And do feel free to reciprocate! Another one of those darn rural myths! Nelle was a complicated person and never finished a second novel, but she said what she thought. Love that letter and her boldness and complete honesty to a person she had never met but completely knew through his writing. Great post, Letizia. Now I must add The Butterfly Tree to my list. You’re right, how great to be so bold and honest in one’s praise to someone you’ve never met. I wonder if they did meet in the end. I will have to do some research. What an interesting list! I wonder if Bell was popular in his day. When the book arrives, I will read up more about him. Thanks, Letizia, for another great post. Where is Morgan Library? What a treasure you are to all of us who aspire to read better and more widely. Best to you. Ah, the second-novel doldrums…how I relate to that! Pity she never wrote or finished a second. Thanks for sharing this. It’s like getting to go to the library virtually. I hope you do write a second novel one day, Tom. I also hope you get a chance to visit the Morgan Library one day – you would love it. 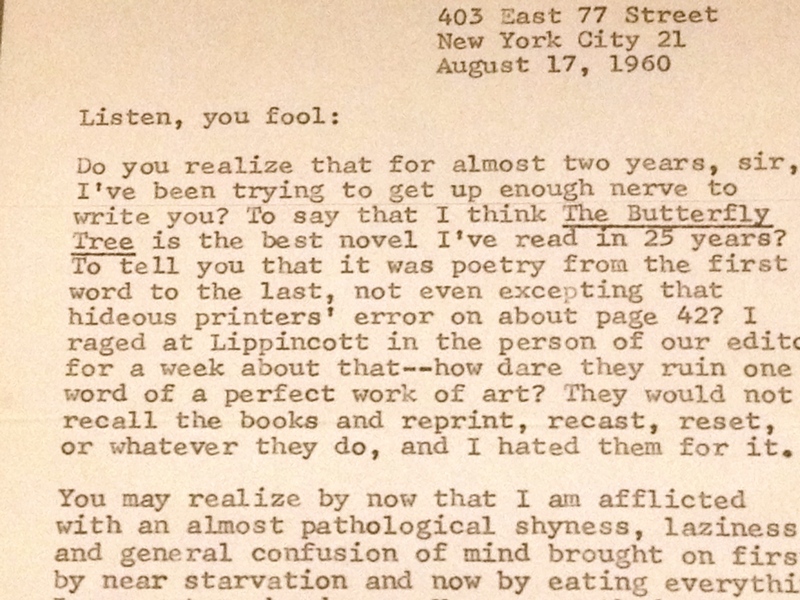 I’m thinking someone should do a one person show, reading all the great letters from one writer to another. Record the show, then put it up on YouTube as a tutorial in letter writing. What do you think? What a great idea. You could do it! Or your son! I would LOVE to know if he ever wrote back, or, heck, even visited her in NY!! Great letter, indeed. I would love to know more as well. Doing a bit more research, I saw that the Morgan library has a few more letters by Harper Lee to Bell so it seems that they did have an ongoing correspondence. What a creative share, Letizia!! I love how she strikes up attention with those opening words, using them in a playful way — truly genius (both the letter and your idea to use it for this post). Hugs. Such great opening words, right? It’s true, very playful! I remember reading and re-reading “To Kill a Mockingbird.” And then I read it again a couple of years ago when my son was completing a book report. Now, I have an audiobook – the reader is absolutely delightful with a joyous and lilting accent. We forget that every word we write, whether in a letter, post, book report, business letter, bears our mark. Writing is letting our voice speak long after the words have been written. I have been going through my dad’s letters and have come across his love letters to my mother. His voice comes forward with us. By the way, I heard once that Picasso always paid for his grocery bills with a cheque (check) rather than cash. People would keep the cheque because his signature was worth more than the cost of the purchased goods. Now, whether that is true or not, it does speak to the nature of the written word. How lovely to revisit To Kill a Mockingbird in so many ways. I imagine that it’s a good book to listen to as well. I love letters. I have a pile of letters from family and friends that I cherish. It’s important to keep writing them as well, perhaps more so today as they are rarer. It must be wonderful to reread your father’s letters – to hear his voice in that way. Letizia great stuff I loved it, you must have had fun finding such a letter. Thanks for sharing you always have something interesting to share with us. So glad you liked it too – it was a wonderful and unexpected find! You must read it now as it was written in the same year as your birth! That would be a fun project, reading 10 books from the year of your birth! I shall be following your example and picking up both of these books as it appears these days that I am sadly under read. History and words…the best combination since shoes and socks. I would hardly call you under-read! I’m looking forward to reading Bell’s book – am most curious now after reading Lee’s praise of it. Not sure I’m famous enough to start a letter that way and continue the tone in the letter. But I love that she did! I think you might just be able to get away with it! Looks like you’ve started a Butterfly Tree craze Letizia! To kill a mockingbird is one of the books that had the most influence on me – it was the first book I read at school that I actually loved and Harper Lee is fascinating for many reasons. What a great letter especially for one who professes shyness! I’d love to think I started a Butterfly Tree craze, haha! But the credit really goes to the Morgan Library. You make such a good point. Lee, who claims to be so shy, is so bold in this letter. What an intriguing person indeed! Let us know what you think of the book. I’ll be more interested in your assessment than Harper Lee’s. Well, I can’t help but feel flattered. I’m so curious to read Bell’s novel and will try not to approach it with overly high expectations because that’s never a good way to start a book. Hey, you! I don’t like this post! I LOVE it! 😄 Miss you, Letizia! I love the fact that it’s written on a typewriter too. There’s a certain warmth in the words, something between handwritten and computer-typed. You should write your next novel on a typewriter!! Very enjoyable post indeed. I love it. Thanks for stopping by and commenting, as always! Last year I attended a series of Saturday classes on American Women Writers, and the one I most enjoyed was–get this–titled “Listen, You Fool” about Harper Lee. 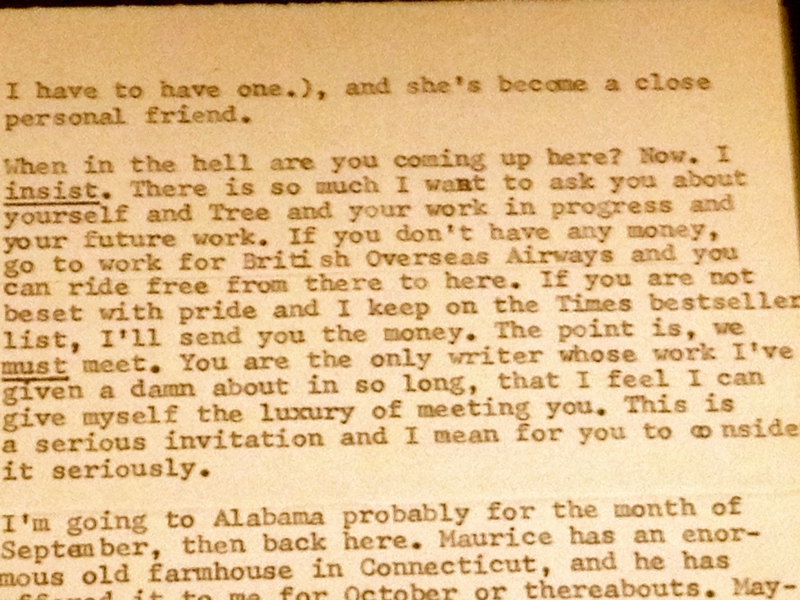 It studied phrases from this letter and applied them to various people and struggles and joys in her life, including a very interesting application to her friendship with Truman Capote (Dill, in TO KILL A MOCKINGBIRD). Your post was an excellent commentary on the letter, Letizia, and you would have made a wonderful addition to the presenters of the series. What a wonderful theme for a class; I love the idea! I was inspired by the Morgan Library’s description of the letter which pointed out many of the fascinating parts of the letter. The series you attended must have been so interesting overall, to include a class such as this one.